What’s the best way to start archery? Find a local club near you, and either call or e-mail for information if they don’t have a website. Usually they will have safety classes where complete newbies can learn about safety procedures and how the ranges are run. After you continue, the next best thing you can do for yourself is to find yourself a Certified Coach, complete the safety course, and decide to preferably Level III or IV. Level Is are basically kids camp cheerleaders, and I was able to qualify for Level II after three months of shooting. You want someone that knows the most common pitfalls that trap beginners. Typically the most cost effective way to get into archery (for men, I can’t speak for women) would be to shoot using club equipment until you outgrow their equipment. When that happens, you’ll have a lot more homework to do. Follow the purchasing guide in the sub-reddit. It was written by Anthony Camera, who is known as Viper1 on ArcheryTalk.com. The quality of equipment you buy is dependent on your level of commitment to the sport. Setting up your bow and selecting the right arrows for your new bow is an entirely different topic that comes later. The draw length is the distance between the nocking point on the bow string and the riser when the arrow is fully drawn. To calculate your draw length you would usually draw an extra length arrow and have someone mark its length when you are at full draw. A quick estimate can be determined by measuring your fully extended wingspan (from fingertip to fingertip) and dividing this number by 2.5. (Don't strain as hard as you can when you do this, just stand up straight and extend your arms out parallel to the ground.) You can also do the same trick by dividing your height by 2.5. Do not make major decisions regarding this number, it is just meant to get you close. When purchasing your first bow, also consider that most people’s draw lengths will increase somewhat as their form develops. A method better than estimating is to actually get measured. Either to go to your local pro shop, and have them measure it for you. If that’s not viable, put on a button-up shirt, and measure from the crease to your wrist to the buttons. The draw weight is the weight or amount of force required to draw back the bow. What is the best draw weight to start with? For a beginner seeking to develop good form, it is generally recommended that you choose the highest draw weight that you can pull back and hold steadily for 30 seconds with ease. This is usually 15-25# for a recurve or traditional bow, and 30-45# for a compound bow (due to the let off). What are the different kinds of bows? There are four primary types of bows - recurve, longbow, asiatic and compound. Recurve, asiatic and longbow are generally referred to as ‘traditional archery’. Compound: A compound bow is a bow designed to reduce the force required to hold the string at full draw, hence allowing the archer more time to aim with less muscular stress. Most compound designs use cams or elliptical wheels on the ends of the limbs to achieve this. They are generally quite powerful bows, can use used for target archery or hunting, and can be configured to be shot from barebow with fingers through to full sights, stabilisers and mechanical release aid. Longbow: A bow that generally looks like a long piece of wood, with straight limbs, as opposed to the curved tips found on a recurve. There are a number of variants ranging from the English warbow style through to the slightly more modern Montana flatbow, but all share the same general characteristics: they are relatively long in size (thus the name), and the bow string will not touch the bow anywhere once it leaves the string nocks (the grooves in the limb tips where the string is captured). 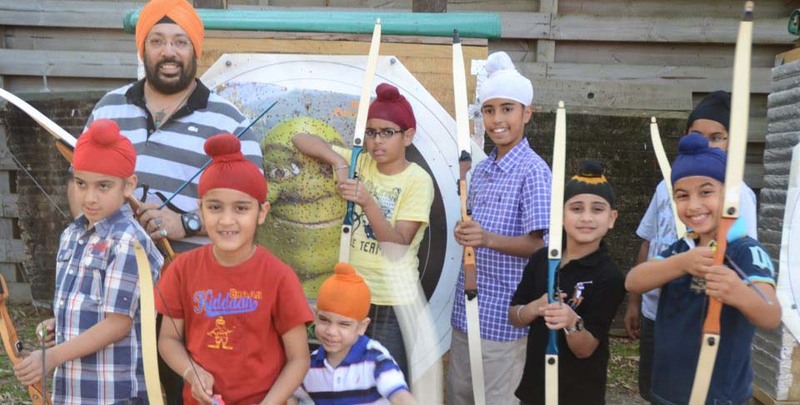 Longbows are shot in the traditional style - no sights or stabilisers. Recurve: The kind used in Olympic archery, that looks like a long piece of material that curves outward at the end. A more modern evolution of the longbow, the limb tips curve forward (towards the target) with the string following around them to the string nocks. When drawn, the limb recurves curl open, storing energy. This makes recurves a little more efficient and thus easier to draw than a longbow of equivalent draw weight. They can range from one-piece and takedown (bow comes apart for transport) wood construction through to modern carbon fibre and alloy materials, and can be shot in traditional style (as a longbow is) through to full sights and stabilisers. Asiatic: a variant of the recurve bow, but developed separately in Asian cultures to meet their unique needs. Also called a horsebow, for its compact and powerful design designed to be shot from horseback for hunting and defence. The asiatic bow has radically recurved limbs which are extremely flexible and allow a full length draw to be achieved with a far shorter bow than an equivalent recurve or longbow. To assist in this, extended stiff tips called siyahs may be fitted to the limb tips, although not all asiatic bows have them (there are many sub-variants, including Mongol, Hungarian, Korean, Turkish, Persian and Chinese). Asiatic bows are shot in the traditional style, and usually with the help of a thumb ring - a horn sleeve which fits over the drawing hand of the archer, to take the pressure of the string as the bow is drawn, and to aid a smooth and consistent release. There are also several kinds of less commonly used bows, as well as some disparities between the definitions of modern bows and bows throughout the rest of history. These bows can be obtained through a number of reputable bowyers, and some have been made to perform as well as modern recurves. When shooting with fingers, what is the typical way to place your fingers on a bowstring when drawing? This generally depends on what type of bow you are shooting. Olympic Recurve: Most commonly you place your index finger above the nock, while your middle and ring fingers are placed below the nock. This is known as “split finger”. Finger pressure is typically 50-40-10 (index-middle-ring), though this can range 60-40-0 or 50-50-0 or 40-40-20 depending on the shooter. Finger pressure will also affect the dynamic tiller (how the top and bottom limbs dynamically release their energy), and bow will need to be tuned if finger pressure changes. In barebow (no sights) archery, techniques like string walking and face walking are often used as distance sighting methods. In this, the archer counts the number of string threads underneath the nock, and places his or her fingers (or more likely, the edge of a tab) there. The archer has numerous reference points for different distances (eg. 5 strands @ 18 meters and 10 strands @ 25). While you can hold the string any way that feels comfortable, these two styles represent the most common techniques. The use of a thumb ring for shooting an asiatic bow means the string is actually drawn with the thumb ring itself, supported by the thumb, which is clamped into place with the index finger. What does the “9 steps of good shooting” have to do with me and why are they important? The 9 steps of good shooting are a great rule of thumb to shoot by and will help your accuracy. Stance, Nock, Set, Pre-Draw, Draw, Anchor, Aim, Release, Follow-Through. All of these are very important steps to shooting properly and are something beginners should start with. A stance is the position you are shooting from, commonly; feet shoulder width apart, with the arm you are holding the bow with facing towards the target. Anchor - the point to which you bring back the string when drawing for a shot. The anchor point is usually underneath the jawbone (Index finger knuckle under jaw), or side of the face (index finger in corner of mouth using three-under) to give the most consistent shot. Choose whatever is most comfortable that allows you to shoot the same shot every time. Generally target recurve shooters shooting NTS opt for below the chin anchor. Anchor will vary from individual to individual due to bone structure. Nock - the notch at the end of the arrow that clips onto the bowstring. Pre-Draw - Displacing the string about 1” from rest to pull the bow into the bow hand. How do I determine my ideal bow length? The bow length is calculated from your draw length, a bow that is too long will be inefficient to draw; a bow that is too short will cause overbending of the limbs and pinching of the fingers from the string. Target bows tend to be longer and heavier for greater stability, while hunting bows tend to be shorter and lighter for portability. Do I have to go to Geelong to shoot a Geelong? No. Target archery events are called rounds and these consist of a number of ends at different distances. In Australia, there are standard groups of distances shot and these have been named after various cities and towns. Hence a Geelong is a round of 90 arrows shot at 30m with a 122cm target face. 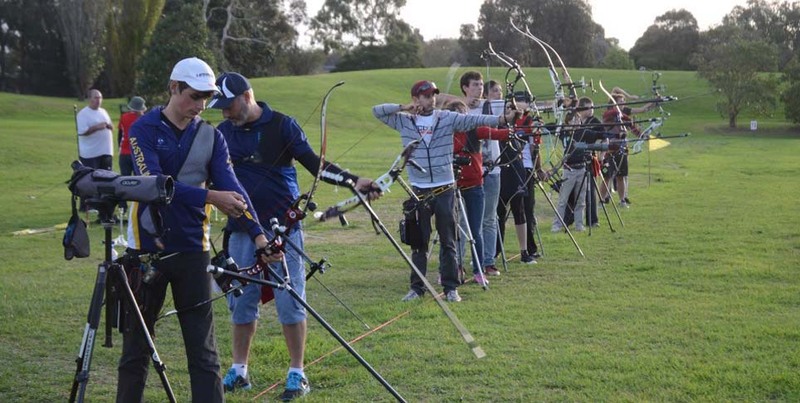 For a full list of rounds please follow this Archery Australia link. A nock is the small Y-shaped clip that attached to the end of each arrow. The nock allows the arrow to gently clip onto the sting of the bow. Nocks come in various shapes sizes and colours. What are the parts of a recurve bow? 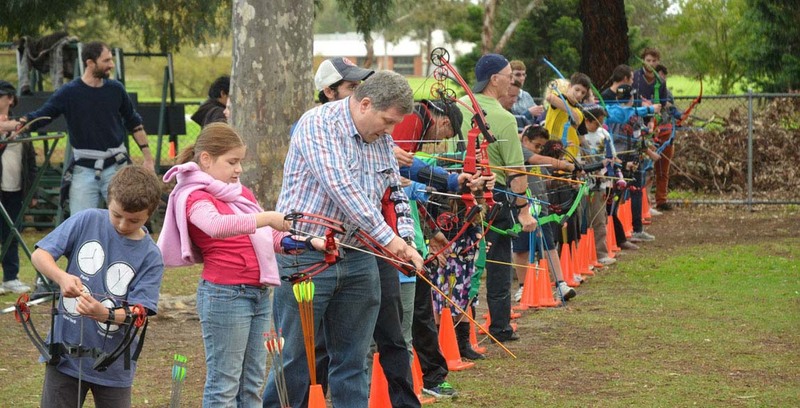 Please follow this Archery Australia link. Do I need to have my name on my arrows in competition and if so how should I do it? Yes you have to identify your arrows when shooting in a tournament. World Archery rules state that you can identify either the shaft or wrap. You cannot have your name or initials on the vanes. What are the various age classes? An athlete may participate in the Cub Class in tournaments when the competition takes place up to and in the year of his or her 13th birthday. Cub athletes may also participate in Intermediate, Cadet, 20&Under and Open Age Classes. An athlete may participate in the Intermediate Class in tournaments when the competition takes place up to and in the year of his or her 15th birthday. Intermediate athletes may also participate in Cadet, 20&Under and Open Age Classes. An athlete may participate in the Cadet Class in tournaments when the competition takes place up to and in the year of his or her 17th birthday. Cadet athletes may also participate in 20&Under and Open Age Classes. An athlete may participate in the 20&Under Class in tournaments when the competition takes place up to and in the year of his or her 20th birthday. 20 and Under athletes may also participate in the Open Age Class. An athlete may participate in the Master Class in tournaments when the competition takes place in the year of his or her 50th birthday and up to the year of his or her 60th birthday. Master Class athletes may also participate in the Open Age Class. An athlete may participate in the Veteran Class in tournaments when the competition takes place in the year of his or her 60th birthday and up to the year of his or her 70th birthday. Veteran Class athletes may also participate in Master and Open Age Classes. An athlete may participate in the Veteran Plus Class in tournaments when the competition takes place in the year of his or her 70th birthday and over. Veteran Plus athletes may also participate in Veteran, Master or Open Age Classes. What is the Open Class in competition? 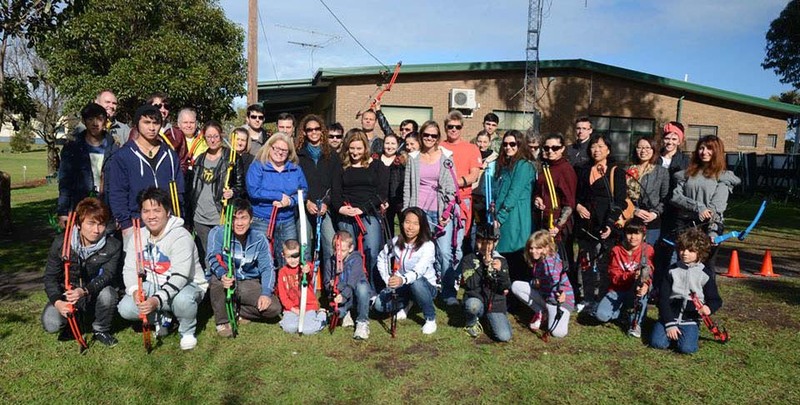 A QRE is a Qualifying and Ranking Event registered with Archery Australia and listed on the National Calendar, designed to allow greater opportunities for people to qualify for international events and for the National Ranking List. To qualify in the National Ranking List you must register three (3) QRE scores within a 12 month period. What is the shooting line? The line where athletes must stand when shooting. At least one foot of the Athlete must be behind the shooting line when shooting. What is the waiting line? What is the 3 metre Line? Positioned 3 metres in front of the shooting line. When an arrow is accidentally released or dropped and lands within the area delineated by the 3-metre line, the arrow is deemed not to have been shot. What is meant by “Double-Entry” scoring? “Double-Entry” scoring is where two archers (usually on the same target} independently score the same arrows and then compare their scoring afterwards. This is done to ensure the accuracy of the scoring. It is important that the second scorer does not just copy the first scorer’s score sheet, as this defeats the purpose of Double-Entry scoring. What is a release aid? A release aid is a trigger device used by compound archers to assist in the draw and release of the bowstring. There are many makes and styles of release aids including ones that have a trigger that you pull or press and ones that release when enough pulling force (or back tension) is applied to them. There are also release aids that are held in your hand and others that are strapped to your wrist. It is important to try a few to determine the style you prefer.